For those of us not interested in getting too technical or even turning a stove on for Halloween, have I got the perfect recipe idea! 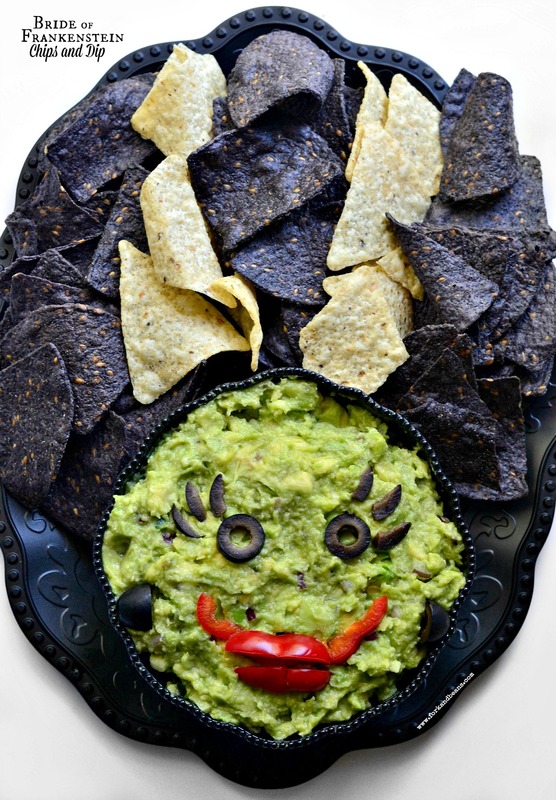 The Bride of Frankenstein really doesn’t get too much attention for Halloween these days so I thought I would showcase her best in guacamole dip and chips form. Now you don’t have to make the guacamole the same way I did. This is just how I typically make guacamole, nothing special so there is room for variation. Just keep two things in mind: 1). Make sure it fills up to the brim of whatever bowl you do use, and 2). Go a little easy on the add-ins you choose to use because you want her face to be as uniformly green as possible…if that makes sense. Not too lumpy or multi-colored from cilantro or onions, etc. And that is it really. Simple. Easy. Fun yet has that perfect Halloween flare to it. Your guests will love scooping up this Bride of Frankenstein guacamole dip. Mash the avocado in a mixing bowl until smashed completely. Mix in the minced onion, garlic, and jalapeno. Add the lime juice. Season with salt. Place into a bowl and set on a platter. Assemble the face with olives and bell pepper. Place the chips on the platter in alternating rows. This post is a part of Vegan Month of Food 2014. You can check out the other Vegan MoFo posts here. This is so fun and creative! Pinned! This dip is adorable! I might have to have a Halloween party just so I’ve got an excuse to serve this to everyone I know. This is so simple and brilliant! I love the animated gif, too. No!! Halloween needs more help, I would LOVE to see your holiday theme! Please do it! This is great because we all need a little savory to balance out the sweet on Halloween 🙂 Delightful! Creative. yum . Great Job. Very cute, Cara! Love the simplicity of it and who doesn’t enjoy good guac and chips? Cara, I love that you understand the everyday simple life of a creative women and the complicated center of a entertaining mastermind! You love what you do….. Should I say anymore. how cute! love the lashes. the face kinda reminds me of the creature from the black lagoon! You know, I have never seen The Black Lagoon but if it looks like this dip then maybe watching it will make me hungry 🙂 Thank you so much for the comment!